Combining a classic silver pearl finish with posh styling, the Veranda 6-Light Silver Pearl Semi-Flush Mount Light from Filament Design beautifully highlights the charm of your home. This gorgeous centrepiece displays a collection of sparkling glass crystals set against the gleaming finish, creating an eye-catching accent that shines amid your decor. Its compact size makes it a perfect choice for bringing lush, lavish style to smaller spaces. 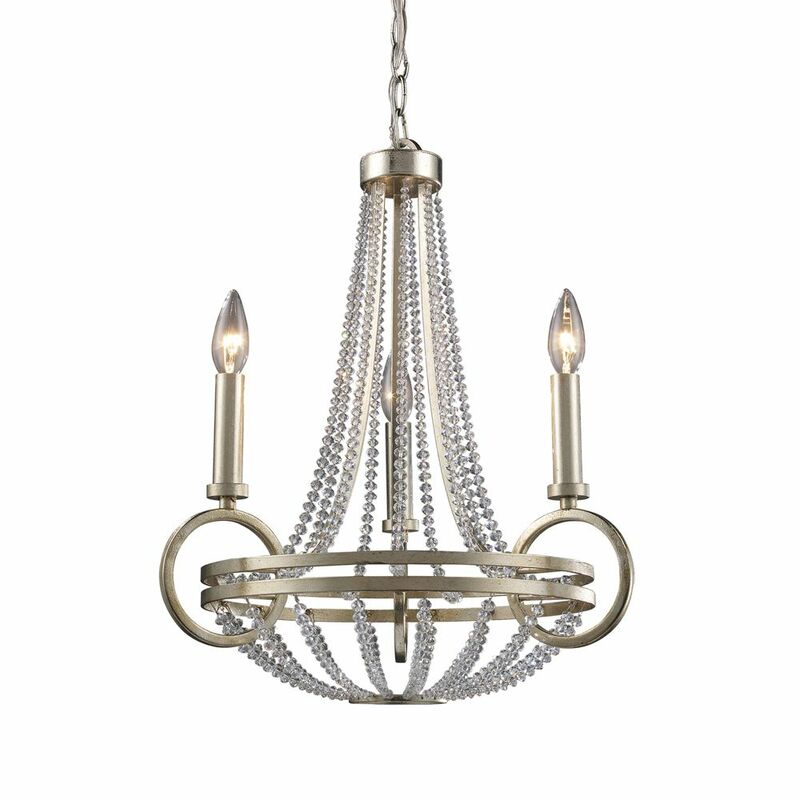 Add sparkling elegance to your home with the heritage three light iron and crystal chandelier. With curvaceous scrolling arms in aged iron finish, this traditional chandelier is the perfect complement to any decor. Featuring crystal cut French pendants and facetted beads, this alluring fixture will bring brilliant, glittering light to any room. This 3-Light Chandelier features a Brushed Nickel finish, optional decorative Bronze trim rings and adjustable Quck-Link chain. The Adjust-a-Dim dimming Module converts the existing switch to a 4-way dimmer. The fixtures uses (3) standard bulbs, sold separately. Suitable for both casual and contemporary interiors. 3-Light Ceiling Mount Renaissance Silver Chandelier Taking styling cues from the Art Deco period, this collection features clean lines and unique design elements. The lights are supported by rings that gracefully float around a larger double ring. Finished in Renaissance Silver Leaf with cream fabric shades, this series is versatile and contemporary. Shades are optional on items with crystal.